This quick and tasty recipe is fun to make with children or friends and looks very arty! 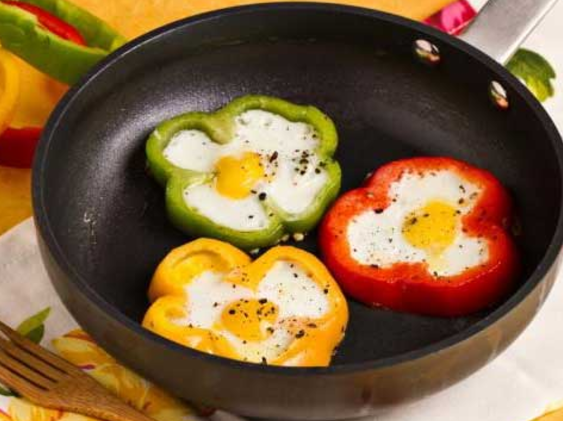 You need: eggs, peppers of different colours, olive oil, salt and pepper. Wash and dry the peppers and cut across with a sharp knife to make slices around 2cm thick. Cut out the central part and discard the seeds. Take a non-stick pan and pour in a couple of table spoons of olive oil and heat up. When the oil is hot add the slices of pepper and cook a few seconds each side. Break one egg into a small bowl and slide the egg inside the slice careful not to break the yolk. Repeat this action for each egg. Cover with a lid and cook the eggs to your taste on medium heat.